A soothing mineralising thermal water. A soothing mineralising thermal water. Remarkably active. Contrary to what is usually thought Vichy thermal waters contain only small amounts of sodium chloride, more generally known as salt, common salt or table salt. The waters are taken directly from hot springs so you can benefit all the more from their goodness. Whether you use Vichy thermal water for cooking or drink it as part of a spa treatment, it helps counter the effects of an overly acidic diet, facilitates digestion, and reduces fatigue and muscle cramps. It also lowers cholesterol and reduces the risk of cardio-vascular disease. A naturally sparkling mineral water with a very specific taste, Vichy Célestins has been famous for hundreds of years for its beneficial effects on our body and our complexion. What is not so well known is that it is rich in minerals and sodium bicarbonate, which means that it also has a unique beneficial effect on the ingredients used in cooking. Vichy Célestins mineral water increases the mineral content of a recipe. This is particularly the case when preparing a soup, or a consommé clear soup made with concentrated stock, but also for water based sorbets or ices. You get pleasure and minerals at the same time ! Our modern lifestyle often encourages us to eat food which is too acid(1.) (meat, dairy products,…) and which can have harmful consequences for our health. An in vitro scientific study carried out on an artificial stomach by Dr Vatier(2) has shown that the antacid properties of water with a sodium bicarbonate content, regulates the stomach's acid-base balance during digestion. VICHY Célestins mineral water is rich in sodium bicarbonate with 2,989 mg/l. By cooking with VICHY Célestins mineral water, you are replacing part of the table salt (sodium chloride) normally used in cooking, with the sodium bicarbonate which is naturally present in the mineral water. It adds a natural flavour, and, for certain dishes, reduces the amount of added salt required, as the bicarbonate, acting as a taste flavour enhancer, lengthens the time you can taste the food, the length on the palate, and intensifies the flavour of the dish. You want to enhance the flavour of your dish and reduce the amount of salt it needs? No problem! The Vichy mineral salts , sold in the boutique of the Vichy Célestins Thermal Spa*, are a mix of mineral salts extracted from the thermal spring waters at Vichy, and cooking salt/table salt (NAcl/sodium chloride). It helps to reduce up to 40% of the quantity of salt used in cooking without changing your perception of its saltiness (study7 by Vetagro-Sup 2014) and at the same time provides a supplement of mineral salts! * Vichy mineral salts are on sale at the boutique of the Vichy Célestins Thermal Spa, 111 Boulevard des Etats-Unis- 03200 VICHY, France. The top chefs know that sodium bicarbonate is very useful in the kitchen for a number of reasons. It can act as a raising agent, help neutralise the acidity of certain fruit, reduce the cooking time for vegetables while conserving their colour, tenderise meat, make meat crustier, prevent sauces from separating... In fact its uses are endless! (1.) Am J Clinical Nutrition. February 2010. (2.) In vitro evaluation of antacid properties of Vichy Célestins and St Yorre mineral waters, using an artificial stomach as a model: J. Vatier, C. Célice-Pingaud, R. Farinotti , « Annales de gastro-entérologie-Annals of Gastroenterology», November 1998, Volume 34, N° 4, pp 157-163. In terms of spa treatments the Vichy thermal waters help you to reduce stress and relax, due to their anti-inflammatory properties. 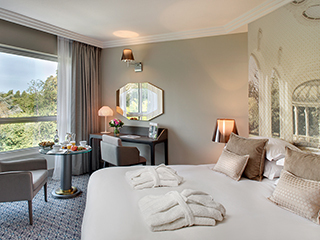 Discover our Care Treatments à la carte, residential stays and ideas for week-end breaks! Using mineralising Vichy thermal water as an everyday beauty treatment, lets the minerals rebalance, reinforce and regenerate your skin, making it stronger every day. Discover the range of skincare products produced by the Institut des Laboratoires Vichy, unique in the world, at the Vichy Célestins Thermal Spa (Vichy- France).